The use of memos is an important part of many methodological traditions and educational and teamwork practices. For example, they are key to best practices in grounded theory in the tracking of design and analytical thinking during a project. Memos can be very useful to support a rigorous code system development process in collaborative qualitative and/or mixed method research. 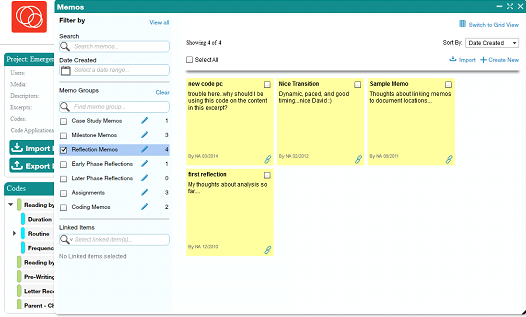 Further, memos can be used to communicate to students or research team members over the course of a class or research project. 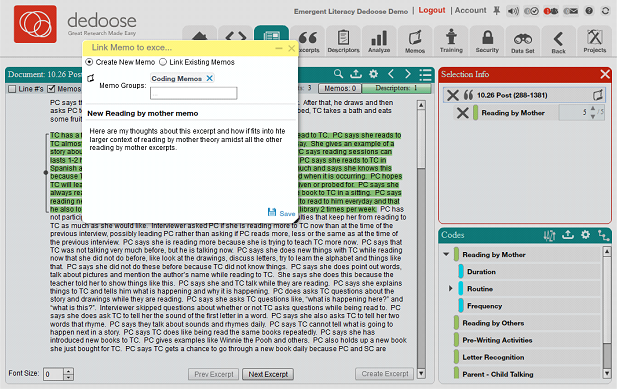 The memo system in Dedoose, fully revamped in late 2014, is designed to be as flexible as possible to allow for any researcher, team, or instructor to make use of the system in efficient and effective ways. 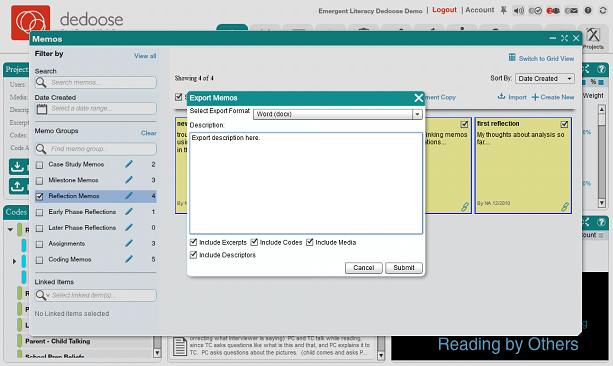 Memos in Dedoose are organized in a custom, user-defined, group structure depending on a project’s specific needs. Memos can be free floating, not linked to any items in a project database, or linked to any number of items. Being able to build groups for memos gives the researcher the freedom to organize memos in any number of ways. 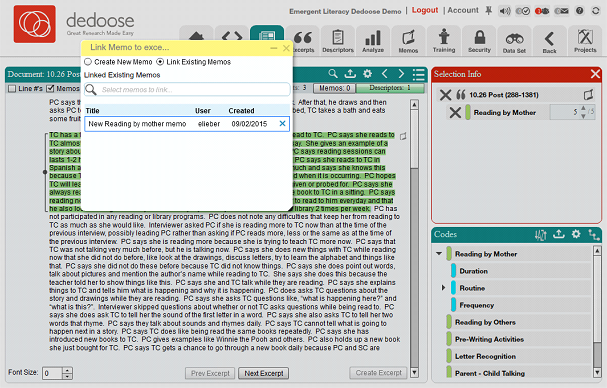 Finally, Dedoose memos can be easily exported to Word files for local use in manuscript preparation, fodder for team discussion, data sharing, and report generation. Free floating memos, stored in an ‘analytical thinking’ group, created over the course of a project from a more reflective, grounded theory perspective. Such memos might include thoughts about observations within the data and the types of codes needed to sufficiently frame the analysis at different stages of the project. These memos can be exported later and organized by date to see how the framing and understanding of data has evolved. Also, these, or any, memos may be linked to exemplar data in the project for further contextualization of the memo content upon review. 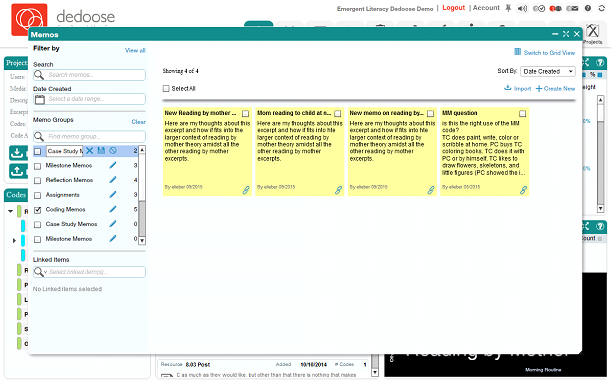 Free floating memos created in an ‘assignments’ group created by an instructor or team leader to communicate particular tasks for others linked to the project. Ex. a ‘Week One’ memo with content like, ‘here’s what I’d like you to be doing this week.’ These memos can be viewed by students or team members so they know what is expected of them in a particular time period. Mapping project activity memos in a ‘project path’ group also created over the course of a project to document milestones—essentially documenting the ‘conversation’ among team members as thinking evolves over the course of a project. In this group, team members might write memos related to: proposed or actual code tree restructuring with content about the rationale for and changes made to a code system/tree, perhaps reconfiguring into a hierarchical structure, at a particular point in time; proposals for new codes; and/or recommendations for revision to code application criteria. Again, any memo can be linked to associated content and when exported the linked content can be included so the team has all the information necessary to discuss the theoretical meaning and value of making changes in the context of real data toward a more accurate representation of the data. The Memos Workspace is a movable and resizable pop-up in Dedoose. 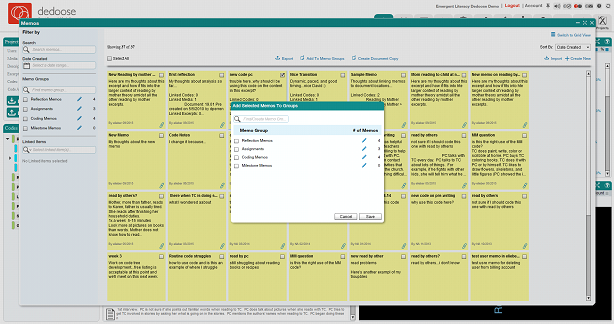 As seen in the left panel in the above snapshot, the workspace includes fields for filtering by memo title, content, date of creation, groups, and/or linked items. This example shows the memo filtered to just those in the ‘Reflection Memos’ group. From this view memos can be created, opened, edited, added or removed from groups, imported, and deleted. 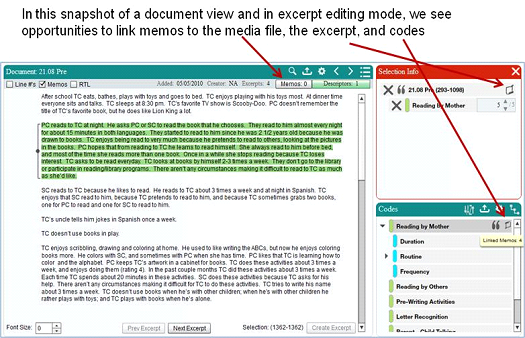 Further, when one or more memos is selected, context menus for exporting, adding to new groups, and saving as documents to be treated as media in the project for excerpting and tagging will appear above the selected memos (as shown in the next screen shot). 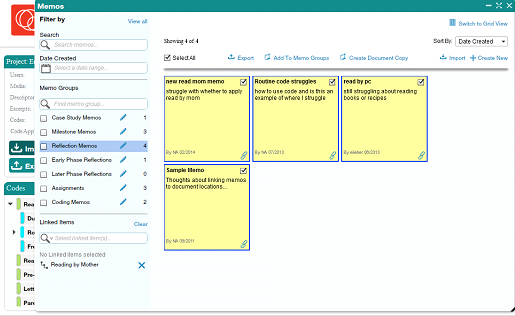 Finally, it is important to note that the Memo Workspace and memos can be left open when working on other aspects of a database and, if needed, resized or minimized to allow for easier viewing and navigating in other Workspaces. Continue to edit or add the memo to groups and, when finished, click ‘Save’ and then close the memo. Note that new memo groups can only be created when creating a new memo or editing a memo. Once the group is created, it can be used to link or remove other memos. While it is not necessary to link a memo to an object in Dedoose, it is often desirable and this can be done from the Memos Workspace or when working with the object in question. Finally, again, the memo, or other newly linked memos, can be left open, resized, minimized, and/or moved if you wish to add content as you carry out further excerpting activities. Click ‘Ok’ when download is complete. Click ‘Open’ to complete import. In the Memo Workspace, you have the option to view memos in a tile format (the default) or a grid format. You can toggle these views by clicking the ‘Switch to Tile (or Grid) View’ option in the upper right corner of the pop-up. When in the Memos Workspace you can use the ‘Sort By:’ drop down menu items to sort your memos by Date Created, User, or Title Creation Date. When in Grid View, you can also sort by any of the columns by simply clicking the column header. Close the memo when finished. Click ‘Yes’ to confirm delete and memo will be deleted. Edit the group title and click the save icon, click the ‘X’ icon next to the group title to delete the group, or click the cancel icon if you change your mind and you’ve completed making the desired changes. Click ‘Save’ (Below is the ‘Add to Memo Groups’ pop-up). Close the Memos Workspace and you will find the new documents among your media files.